Shannon and Adrienne had always been friends, which helped when Shannon felt shy. Adrienne later became friends with Jen and The Group. Some of the girls would be willing to do anything to be closer to Jen in The Group, even bully others not as popular. 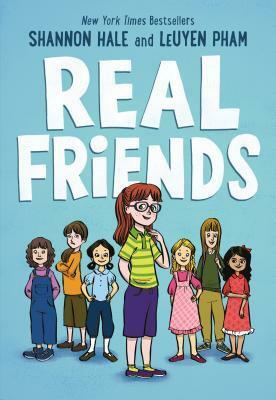 This is a very real and sometimes painful look at elementary school years for girls. It's soul crushing to not be popular, and Shannon Hale drew on her own memories to tell this story. That gives it the emotional resonance for the reader, who inevitably would have felt the same growing up. LeUyen Pham's art fits very naturally with the narrative, giving each character their childlike appearance and mannerisms without seeming "cartoony." We don't see the motivations for the other characters unless they tell Shannon, who is the point of view we're following. My daughter also read this book and enjoyed the artwork. Shannon's story really resonated with her, and she particularly liked the hopeful ending. The characters felt very real and approachable to her. This is a middle-grade book, but even older readers will appreciate it and its honesty.